I made these muffins and they are delicious! I made half blueberry for me) and half chocolate chip (for my kids). I think the blueberry tasted better. I am definitely making these again. Delicious! They are everything that comments and story promise–sweet, tender and moist. Perfect! These are great! Just to clarify – these with whole wheat are 4 freestyle points and the gluten free ones are 5? Just noticed there was a difference. Can you use white flour? Same amt? They were tasty. However, when I put the ingredients in weight watchers recipe builder, mine calculated out to be 5 points each. No biggie. I am going to enjoy them all week. ???? brown sugar -25 points, honey -8, oil -4, white whole wheat flour -5, unsweetened almond milk – 1 (1% milk is 4, but the points come out the same with either), quick oats -13. Divide all that by 12 muffins and each one is 5. I came up with 5 pts too using the recipe builder. Hi, These seem delicious! I tried to make them but I did it in a loaf pan and I had a big problem with how thick the batter was and them being undercooked. Does anyone have any tips for this? Did anyone else have this problem? No matter how long i left them in the oven at a lower temp they stayed undercooked in the middle! Looks great, but using the nutriton info given and my smartpoints calculator, it actually comes to 6 smartpoints, not 4. These are absolutely delicious!! I doubled the blueberries and used whole eggs. I have had them all week with some greek yogurt and they are very filling. Took some to my work group and they loved them. 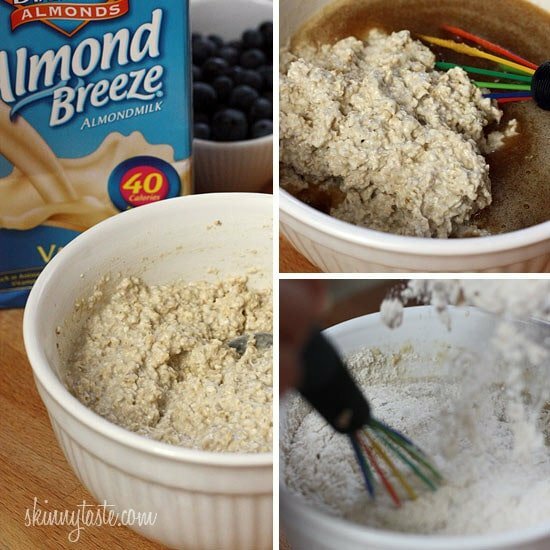 omg _ I made these and changed it around a little bit – I deleted the honey and added 2 mashed ripe bananas and 1 cup of fresh blueberries -1/2 scoop of vanilla quest protein powder and I reduced the milk a little bit. I baked them in a mini muffin pan – I made 36 muffins – each muffin was less than 2 ww freestyle points. These are amazing! Everyone in my family loves them! I’ve been asked to make them again this weekend. Can’t wait to try other add-ins: chocolate chips, bananas, apples, raspberries, etc. I can’t say these are insanely great, but they do taste good. And because I had all the ingredients already, that was great! I made this today for the first time. I used 2 whole smaller-than-large eggs (since eggs are free on WW now – woo!) and a cup of cranberries (coarsely chopped) instead of blueberries, since I had a bag on hand. Had to substitute maple syrup for the honey, since I was out of honey. Also threw in the zest of one orange. I was worried at first, since the batter was a bit runnier than my normal muffin recipes – probably because I tinkered with the eggs and subbed syrup for honey – but they baked up nicely. Adding some toasted walnuts pieces to the mix would have been a yummy addition and upped the protein (and, unfortunately, the points). Thank you for the recipe…I’ll definitely make them again, experimenting with the fruit as the seasons change. Can you use whole eggs instead of just the whites? And where do you get white whole wheat ? Trader Joe’s or maybe Whole Foods? Thank you for all the great WW recipes. I made these a couple of days ago and they were a hit! Even my picky eater loved them :)I followed the instructions exactly. I have been making these skinny taste muffins for years now! My family loves them and this recipe has yet to disappoint anyone who has tried them! What are some suitable substitutes if you don’t have applesauce on hand? Looks good!! Can you make without the brown sugar? Or substitute with something to make it healthier? Sure, use whatever sweetener you wish. I highly recommend this recipe. They’re moist and not too sweet. Thank you! Wow! What a huge hit in our house with our toddler. Thank you! I baked in a non-stick muffin pan which I sprayed with Pam. No liners at all. Oh these are so delicious! Whenever I eat one I feel guilty because I cannot believe all this deliciousness is just 127 calories!!!! I made twice with biluberries. Last time I was out of blues so I subbed Raisins and sprinkled some chopped walnuts on the top of each. Adorable and delicious variation! You have a real winner here Gina!! Thanks. I put oil on my liners and they still stuck to them. Is there anything to do to help not have them stick? I used foul liners and then sprayed them and they did not stick. I have not tried with paper liners. These are awesome! 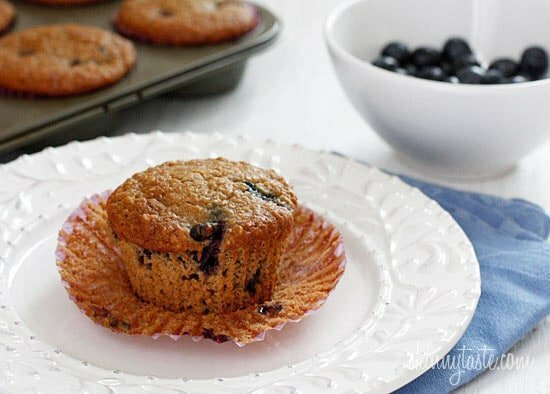 Your husband is right about them being the best blueberry muffins EVER! I will definitely experiment with different add ins. I love these muffins. I make them at least 2 times a month, and freeze them to take to work for a mid morning snack. I was so excited to see they are only 4 SP. However, when I put them into the calculator on the WW app, I get 6 SP. a little bummed, but I will still keep making them, they are worth it for a healthy indulgent snack with coffee. Thanks for clarifying Gina, made them again this morning,!! I only have whole wheat flour instead of white whole wheat flour. Should I substitute it 1 to 1 or use all purpose flour instead? Just made these muffins! I have been on WW for several weeks and really missing something sweet and missing bread and I am so happy I found these little treats! Delicious! What would you use to increase the protein in these? I just made these this morning. They are not too sweet and definitely more like baked oatmeal than muffin texture, like what is stated in the recipe. My son loves them and I don’t expect them to last long even though I doubled the recipe! I didn’t have any apple sauce so I grated a couple apples until I had the right amount for the recipe. Thanks! Where do you find white whole wheat flour? I calculated the smart points to be 6 per muffin assuming 0 saturated fat. Am I wrong? 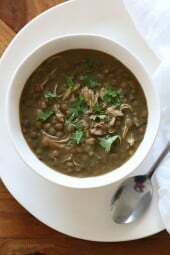 This is my second week making them – they are delicious, thank you for the recipe. Really great way to make sure your fruit is not being wasted during the week! Made a batch with chopped up strawberries, my family likes both varieties! Hi I am new to your page, just wondering with blueberry muffins th I know white whole flour can be use in any recipe it’s interchangeable but I like to use all purpose flour instead ? Just made this recipe with rave reviews from husband and 18-month-old. (The latter kept calling them cookies and couldn’t get enough!) Thank you for your healthy and creative recipes! It looks like a wInderful recipe I would love to add to my recipe book, but i was wondering if you can you use stevia or erythritol instead of sugar? How would you compensate for the lost bulk of the brown sugar/honey? These are very good. However, I think the calorie content is not correct. I imported this recipe into Myfitnesspal.com and the calorie content with the brown sugar replaced with Splenda Brown Sugar blend was still 158 per muffin. I used old fashioned oats and light vanilla soy milk because it’s what I had. I topped them with a sprinkling of crunchy raw sugar. My five year old and really picky three year old loved them! Gina, thank you for your many delicious healthy recipes that have become regulars in our home. When my cooking muse cannot decide what is for dinner, I turn to you and SkinnyTaste. You never disappoint. Your Insanely Good Blueberry Oatmeal Muffins just came out of my oven. They rose beautifully, smell delicious and are looking yummy . While preparing them, I realized that honey is in the ingredient list, but agave is in the directions. Thinking the agave is a typo (don’t we all have those! ), I used 2 tablespoons of honey and ignored the agave. The way the muffins look and smell, I know they will be delicious. Fixed. 🙂 Glad you enjoyed them. Could you use vanilla almond milk and then cut some sweetness out somewhere else? I make these almost every week. They replace my two Munchkins at Dunkin Donut every morning and much healthier. Love them! Do you think these would work if you prepared the batter the night before and baked the muffins fresh in the morning? Love your recipes! Thank you! I made these this weekend. My family of 6 really liked them! I made these last night and they are delicious, but according to my calculations, these come out to 6 smart points, not 4. Your recipes are delicious and so helpful for those on Weight Watchers. Thanks Gina. Gina thanks so much for explaining that, it’s super helpful! It’s also good to know these muffins are only four points each! Again, thanks so much for all your delicious recipes. I have all your cookbooks. They are fantastic! When I first read Insanely good I thought the title might be a little overrated. Well I was wrong. These are insanely very good. Five stars. My kids love them as well. Love the ingredients in your recipe. Made them for my husband to take to work for snack cause he is watching his cholesterol. The only thing is my batter turned blue after adding blueberries. I even tossed them with some flour. How can I avoid this in future? Taste great but color is not appealing. If you used frozen blueberries, rinsing them first will prevent the batter from turning blue. These were amazing and so moist! I want to try them with other fruits like raspberries and peaches. These were so delicious. I made a batch this week, and we devoured them. I just made another batch and I did it mostly in cuisinart and let it sit. I also used mostly regular oatmeal, as I was low on instant. I used frozen blueberries and did half mini semi sweet chocolate chips. I love them. Thank you for this amazing recipe. They truly live up to their name. What kind of oil? The recipe doesn’t specify. There is an ‘*’ next to quick oats, but nothing else associated with the ‘*’. I loved these!! I only had old fashioned oats, and I totally forgot about grinding them or soaking them so I didn’t, but they ended up giving the muffin great texture!! I made them for myself for the week, so I had a lot of left overs, and I put them in the freezer so they wouldn’t go bad, and they froze really well!! just pop them in the microwave for about 45 seconds and they taste fresh baked! Could you make them gluten free using a GF flour substitution? Made this recipe this morning for my kids breakfast. They were delicious. I didn’t have vanilla extract so I used maple extract and it gave it a yummy fall flavor. My kids liked them. Thanks for the recipe. Any suggestions or modifications on making these into mini muffins?? The only changes I would make would be to be use a mini muffin pan and change the cook time to 10-12 min and keep an eye on them. Good luck! I just have to say we LOVE these muffins! This batch I did a combo of blueberries, strawberries and pears that were on the brink of going bad and they are FANTASTIC! My very picky 2 year old gobbles these up and thinks they are cupcakes! Thank you for this insanely good recipe!! Just made these and my first thought was you can tell they’re good for you, i.e. not very sweet. That’s a great thing for me, but my boyfriend will enjoy his with butter and a sprinkling of sugar. My dad and I love them as is. 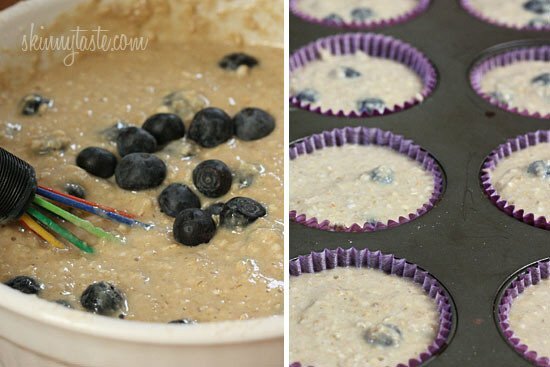 They’re moist, filled with blueberries, and will definitely satisfy me for breakfast on the go each day! Very easy to make too. So glad to find recipes like this to keep me on track and they fit so well into a busy lifestyle. I think they’ll make an excellent snack if needed too. Definitely a keeper recipe! These are amazing, I added lemon zest and that made them even more awesome! These were amazing!!! 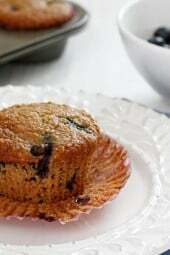 My son and husband both said they were the best blueberry muffins they’ve ever had! Thanks for the recipe. This will quickly become a staple in my house! I just put these in the oven. It’s probably the fifth time I’m making them since I discovered this recipe last year when I bought a huge container of blueberries. These muffins are so delicious! 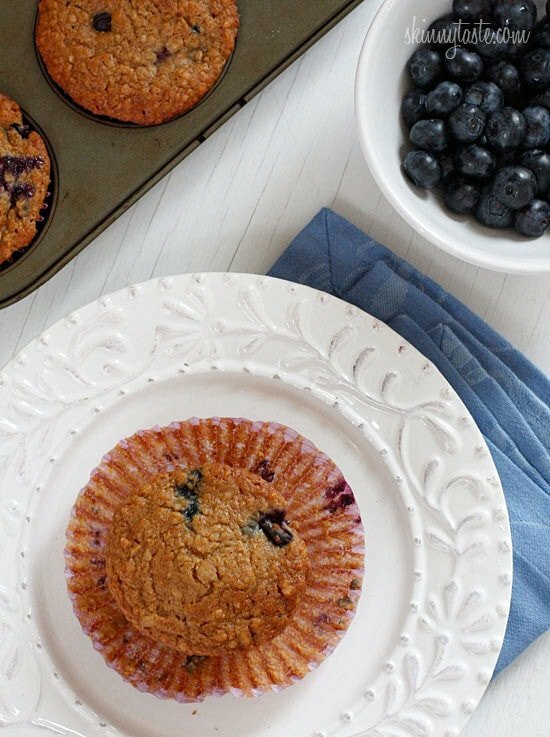 Better than any bakery blueberry muffin and so much healthier. I make them exactly as written except the second time I forgot to put the oats in the food processor first and didn’t really notice a difference so I just skip that step now! ???? Omg these were amazing, and I thought I hated applesauce but this recipe made me try some left over applesauce I had and boy oh boy have I missed out! I didn't have any brown sugar so I used white sugar and they came out great! These didn't remind me of a healthy muffin at all, I can definitely use this as a base for cupcakes, cakes, or muffins! They were moist and tasty! I am seeing the Smart Points as 4, but when I plug the nutrition values into WW I am seeing the value as 6. Are the Smart Points updated on all recipes yet? Thanks!!! Hi can this be made as a waffle or pancake? I made these today and LOVE the flavor but mine came out with the oatmeal a bit crunchy in some places. Did I just cook them too long or could there be another reason? Made these last night and they are delicious! I made these a few days ago and they were sooo good!!! 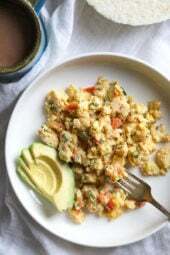 I love easy recipes like this is that are healthy!!! I'm on a very strict regimen due to some meds I have to take – sugar free, yeast free, low fat, low gluten – needless to say it's hard to find snacks and things I can easily pack for lunch. 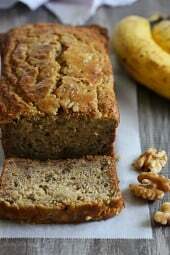 I found this looking for 'low fat' and made the following substitutions to accomodate the rest of my needs: quinoa flakes instead of oatmeal, 3 tbs truvia instead of brown sugar, 3 tbs sugar-free vanilla ice cream instead of agave and vanilla extract, and spelt flour instead of white whole wheat. The muffins look gorgeous, though when tried hot (sorry, I was hungry), the quinoa made it taste a bit grassy. Otherwise they worked great. I'm taking them to a work potluck tomorrow so I'll get to test them on 'normal' people (though I admit I will probably re-test a cooled one later tonight 😛 ). Hopefully the grass taste will be less noticeable when cool. Very very tasty muffin !!! Who on earth wants the regular muffin loaded with unhealthy fats. My kids enjoyed it so much. Instead of apple sauce i used pureed pear. I made it the previous night & the next morning it came out of the liner perfectly even without spraying oil to the liners. Pls keep sharing your wonderful recipes…….. Thank you for this healthy and very tasty muffin recipe. Instead of apple sauce i pureed pear & it came out well. Hope the apple puree would also work out well. Any suggestions to make it less sticking to the liner? Mine didn't come out of the paper liner that easily. I made these for the boys – DH and 17 yr. old. They went in one day! So good! Made them with raisins this a.m. and 17 yr. old asked if I could make them with blueberry/raspberry this afternoon so he could have them for a snack when he gets done with his summer job. Wow!!! Made these this morning and they were fantastic! I'm thinking of doubling the batch next time and freezing some. .. anyone know if these freeze well? I made these twice (once with skim and once with almond milk). They are delicious! I, also, used diced apple and cinnamon instead of blueberries, still delicious. This recipe is definitely becoming my favorite breakfast muffin recipe! How much cinnamon did you use ? And a cup of apples? Yes I used 1 1/2 tsp. cinnamon and 1 cup chopped apples. Really delicious. These are awesome! Thank you! I used coconut oil for my oil, it turned out really well. Thanks for all the great recipes! I didn't have enough blueberries, so I used some blueberries and some raspberries! Delicious! And the berries were frozen. I also love the rainbow whisk! Anyway of cutting down the sugar? Besides that….they look yummy!! They were delicious! Your site is very helpful. can you use steel-cut oats here? Wondering the same thing! Craving these but don’t want to mess them up! I just did and they are great!!!!!! Just made these using raspberries and 1% buttermilk instead. And all whole wheat flour. Very yummy!!! Thank you for the recipe. A keeper! Has anyone actually frozen these muffins? I plan on making a batch of these, and taking one out each night before taking it on the go the next morning. Just wondering if anyone has had success with that? Thank you so much for such a tasty recipe! These were insanely incredible!!! Great recipe!!! I can't seem to find white whole wheat flour. Any suggestions? Made these today. They are outstanding! I made these but swapped the white whole wheat flour for almond flour. I also blended the oats after they soaked. Try it. I was wondering about almond flour!! So it worked??!! Have to admit I was a little worried because the batter seemed too moisty/watery but they came out fully cooked and delicious! Made these for breakfast this week (and will probably last until next week too). Wrapped the individually in press-n'-seal and popped them in a giant freezer bag so I can grab one out the night before to defrost. Trying to cut down on daily spending, so bringing breakfast/coffee from home is my first step in that direction. I only had old-fashioned oats, so I used 1 cup + .5 cups of oat bran and 2% milk instead of almond. We only had sweetened applesauce so I left out the additional brown sugar and honey. We also used a combo of premium dark chocolate and milk chocolate chunks instead of blueberries. Next time, I will grind the oats or use quick, as these turned out pretty dense but they were delicious and are incredibly filling. H declared them "okay for being healthy" initially, but after a days rest and a zap in the microwave, they were infinitely more delicious and became a huge hit, even with the naysayer. I am looking forward to trying this again with other flavor combos – they are absolutely perfect for a quick breakfast-to-go on the way to work! I make a lot of muffins and breads and these might be my favorite. So incredibly moist and delicious and they don't dry out the next day like many healthy muffins. I subbed oat flour for oats but still soaked them in milk (used coconut milk) and it worked great. I used spelt flour instead of ww. I have made them with blueberries and with chocolate chips. They are really delish! These babies are in the oven right now, can't wait to eat them! 🙂 thanks for the recipe!!! Can you use oat flour that is already ground up? If so would you use the same amount? I made these with cinnamon and apple chunks.. SO good!! These were great (as everyone is saying!). Really formed a good basis for future muffin projects! I just had to rave about them on my blog which is about minimalism life & style. 🙂 Thanks!